Try Flexiphene SWCNTs paper today! It’s an all carbon nanocomposite and is flexible and conductive. Made from our patented nanomaterial dispersion technology, put the power of Flexiphene to work in your research and commercial applications. 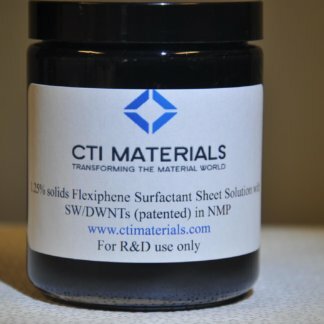 Our Flexiphene SWCNTs paper is made from materials CTI supplies to customers. We currently produce it by vacuum filtration. The paper is typically 32mm diameter and 15-20um thick or 25-30um thick when measured with a micrometer. The resistivity of our Flexiphene paper can range from 2-5 ohms depending on thickness and materials used. Flexiphene paper can be infused with magnetic elements for EMI shielding. The SEM’s of our Flexiphene paper show the highly dispersed SWCNTs.